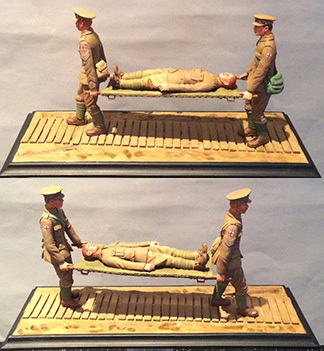 Victory Miniatures wanted to create something for the centenary of WW1 and this model of a stretcher party does just that. The kit includes two stretcher bearers (a Sergeant and a Private) and a Cavalry man casualty. The model is highly detailed and makes up into a fantastic piece. Also included are two extra heads and these have Brodie helmets so a later period in WW1 can be modelled. The base as pictured is available as a separate part and can be ordered with the kit. For multiple orders, please contact us via for a preferential shipping rate.